Dual Rear Rollers - SwapLoader USA, Ltd. The Dual Rear Roller option was created for heavy capacity models. When sub-frames and/or container long rails have NOT been built to withstand the impact forces associated with these demanding load capacities (40,000 lb. & up), you may experience some bowing in the containers over several years of use while loading over a single rear roller. 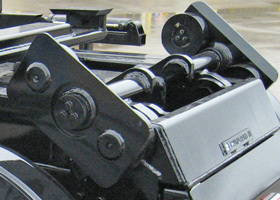 To compensate for sub-frames and long rails NOT built to SwapLoader’s standards, we have developed the Dual Rear Roller option to spread these impact forces over a broader range. The beauty behind this option is that it can be added to your new hoist purchase or order as a kit to retro-fit your existing hoists. Contact SwapLoader for more information on this option.